Super Savings Item! 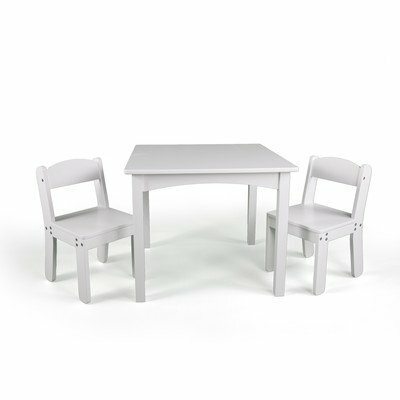 Save 32% on the WonkaWoo Kids Deluxe Table & Chair Set, White, One Size by WonkaWoo at Indsight. MPN: 4408WH. Hurry! Limited time offer. Offer valid only while supplies last. The WonkaWoo 3 piece table and chairs set is just what your toddler ordered. Perfect addition to any pretend kitchen, reading nook, or playroom. The WonkaWoo 3 piece table and chairs set is just what your toddler ordered. Perfect addition to any pretend kitchen, reading nook, or playroom. Available in two finish's it's sure to match any decor. Not only is this table and chair set sturdy but also comfortable with angled back seats. With a 70lb limit per chair this set will fit your little one for years to come. Easy to wipe finish. If you have any questions about this product by WonkaWoo, contact us by completing and submitting the form below. If you are looking for a specif part number, please include it with your message.